Breakfast muffins are one of life’s finest treats. This recipe, which features oatmeal, yogurt, vanilla, banana and honey, is a wonderful break from the many muffins that are packed with sugar and butter. The best part is that having seconds and thirds is guilt-free! Blend banana, oatmeal and egg in your Magic Bullet. Add the remaining ingredients to your Magic Bullet and blend until combined. Add to an oiled muffin tin and bake at 400 degrees for about 10 minutes. Watermelon (and alcohol) are a staple for the 4th of July! This year, celebrate with this refreshing and chilled white wine watermelon frosty! Skip the white wine and make smoothies for the kids. Everyone will love this refreshing drink. Chop watermelon and freeze for at least two hours. 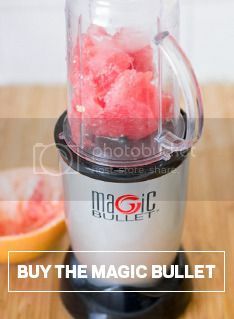 Once frozen, add watermelon to Magic Bullet and puree. Combine wine and lemon or lime juice with watermelon in Magic Bullet and blend briefly. Your 4th of July BBQ just got a lot more delicious! Simple desserts are the best desserts. They have distinguished and identifiable flavors, are lighter and healthier, and – best of all – are so easy to make! This recipe combines the natural sweetness of a mango mash with crushed ice and a touch of light coconut milk into a satisfying dessert that’ll knock the socks off any sweet tooth. Cut mango into smaller pieces and add to Magic Bullet. Blend until mashed, and set aside. Blend ice in Magic Bullet until crushed.